Health and safety is an important part of our work. For each project we are able to supply detailed method statements, risk assessments and COSHH assessments (where applicable). All of our on-site staff hold Construction Skills Certification Scheme cards (CSCS). As a company we have taken an IOSH Managing Safely course and have also been awarded Worksafe Contractor membership from SMAS and CHAS (SSIP). We are also a Constructionline Gold member. We are able to offer CE Marking of Structural Components for Steel Structures (BS EN 1090) to EXC2. Other site staff qualifications include, but are not limited to; Site Supervisor Safety Training Scheme (SSSTS), First Aid at Work, PASMA, IPAF, Abrasive Wheel, Asbestos Awareness. Operatives individual certificates can be supplied on request. Our supervisors regularly conduct site audits to ensure safe working practices and hold toolbox talks with staff. 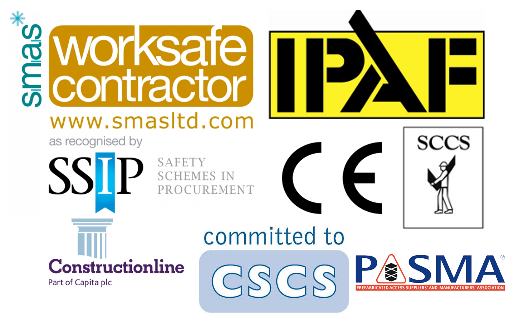 We work with main contractors to achieve Zero Injuries.